Gloriously Free Oats has added an Anzac biscuit to its existing uncontaminated oat range. GF Oats Anzac Biscuits are made with organic, non-GMO ingredients including uncontaminated oats, gluten-free flour (rice, potato and tapioca), banana flour and coconut oil, and are sweetened with coconut sugar and brown rice syrup. They are suitable for a range of specialty dietary requirements and are wheat-free, dairy-free, refined sugar-free and vegan. The biscuits are made with uncontaminated oats sourced from US-based GF Harvest. This means they’re processed separately from wheat, rye and barley. The oats are certified gluten-free in several countries around the world, measuring less than five gluten parts per million, or 0.0005%. However current labelling laws in Australia don’t allow oat products to make “gluten-free” claims. 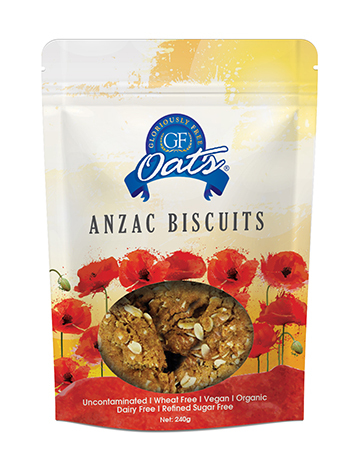 GF Oats Anzac Biscuits are organic, non-GMO, vegan, free from wheat, dairy and refined sugars, and made with uncontaminated oats.